This post is sponsored by The Genius of Play. Play is an important part of childhood development, yet in our highly electronic world children seem to be playing the old-fashioned way, sans electronics, much less. While my children love to play with each other, left to their own devices they’ll spend many hours a day on a device or watching television. As a working, single Mom it’s easy for me to get immersed in the to-do list and allow my children all that screen time because it makes my life easier. However, I know that play has important social, emotional, and physical benefits for my children, and I’m committed to making play a priority in their lives. Children are often creatures of habit. I know mine are. When they have free play time, they’ll play the exact same thing all afternoon and all week long. Not only does that lead to more sibling squabbling as the play of choice loses its luster, but it’s also important for kids’ development to engage in many different types of play. Sometimes all kids need is a nudge to help them mix up their play. 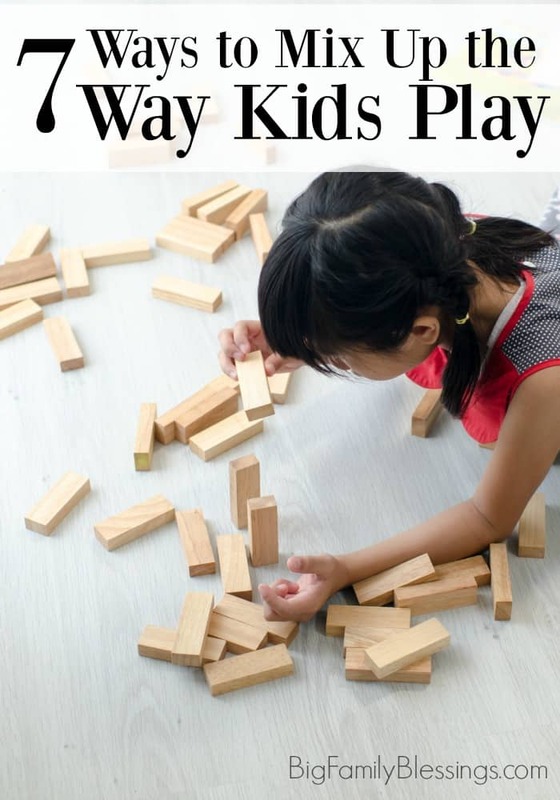 Today I’m sharing 7 easy ways to mix up the way your kids play. Often the biggest hindrance to children’s play is a packed schedule. Play is one of the most important aspects of childhood. Children develop necessary life skills through play. If your calendar is overflowing, pencil free play time right into the calendar. A change in location is often the best way to get kids to vary their play. When it’s time to play, encourage children to head to a different location than the last time. Rather than always heading to the playroom try mixing up playtime locations during free play. The kitchen table is the perfect spot for art, games, or a puzzle. The bathtub for sensory play and measuring activities. Outdoors on a pretty day is sure to get kids moving. Get kids moving between quiet activities and more active ones to keep play varied. When my children were all very young, I’d encourage different types of activities during each break from school work. During one break, they would play quietly individually. Another break would be for art. Other scheduled break types included outdoor time, games, or imaginative play. Setting a timer to keep kids moving through activities is a great way to vary play. Changing activity before kids get bored is key. Consider how well a kindergarten classroom runs simply by rotating centers on a schedule. This keeps kids engaged and excited about new activities. Depending on the age of your children, you might consider setting the timer from 15 to 45 minutes per activity. Consider toy rotation or a center set up. If your children are overwhelmed by the multitude of toy choices or if your home is small, toy rotation or centers can really aid in both organization and keeping kids engaged in varied types of play. Organize toys and activities by type such as building materials, art, and pretend play. Then keep only a few boxes from each type of toy available during playtime. Rotate the boxes once a week or so to keep kids excited about their play choices. Sometimes children are simply overwhelmed by the many choices of play available. Make a list of activities by play type- imaginative, active, construction, art, etc. When your child seems overwhelmed choose a play category and give her several options from the list to choose from. Check out the great play idea lists organized by age, benefit, and prep time over at The Genius of Play. The easiest way to keep kids playing in my home is to limit their screen time. A bored kid is a kid whose imagination begins to stretch. Schedule non-screen time free play regularly into your child’s day. Playtime is learning time for children. Make time in a busy schedule for your children to play, knowing that play teaches children necessary life skills. The Genius of Play is dedicated to increasing awareness of the social, emotional, and physical benefits of play. Their website is full of research on the value of play, as well as great advice to help your children learn and grow through play. Connect with The Genius of Play on Facebook, Twitter, and Instagram.